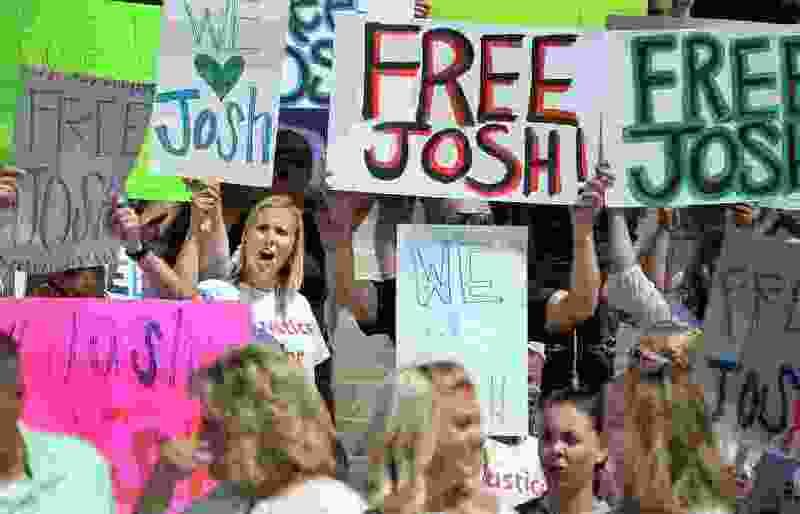 (Scott Sommerdorf | The Salt Lake Tribune) In this 2016 file photo, a crowd of friends and family shout "Bring Home Josh!" at the end of a rally on the east steps of the Utah Capitol for Josh Holt. Riverton • Lori Heaton bought yellow tablecloths to cut into ribbons right after hearing that Josh Holt, her neighbor, was coming home after spending nearly two years in a Venezuelan prison. Sen. Orrin Hatch announced Holt’s release early Saturday. Holt traveled in Venezuela in 2016 to marry a woman he met online while looking for a Spanish-language practice partner. Shortly after he married Thamara “Thamy” Caleno, Venezuelan authorities arrested the couple at Caleno’s home on accusations that they were stockpiling weapons of war. Since then, his neighbors and friends in Riverton have anxiously awaited his return. Around the corner from Heaton’s home, yellow streamers already flew from the fences and flag of her neighbor Wayne Jager. Holt’s trial was delayed repeatedly, and he has said he suffered multiple health problems as he waited in El Helicoide prison. Earlier this month he posted Facebook videos amid riots in the prison, during which he said he was afraid he would be killed by prisoners leading the revolt. Holt and Caleno have denied the weapons allegation against them. U.S. officials said they were a pretext to detain a U.S. citizen for leverage in trade negotiations. “If you knew Josh, from the minute [the arrest] happened, you knew he didn’t do it,” said Tim Heaton, Lori’s husband. Holt coached the Heatons’ son Jon in little league football and is a longtime family friend. In Riverton, celebration plans are pending; Holt’s family say they don’t yet know when he will fly home but expect to make arrangements for a homecoming. Holt was flying to Washington, D.C., first and was scheduled to meet President Donald Trump on Saturday evening. He likely will return sometime Sunday or Monday, said Riverton mayor Trent Staggs. “I’ve had a lot of outreach from residents who would like to be able to welcome him home,” Staggs said. Holt’s family is urging people to show support with ribbons or balloons in bright green — his favorite color. The Riverton City Facebook page will post updates about any public celebrations, Staggs said. Tim Heaton said Holt’s absence was felt strongly in his neighborhood. The flagpole outside the LDS meetinghouse is illuminated at night by lights Holt installed as part of his Eagle Scout project, he said. Saturday’s news “is like Christmas came early,” he said.